Go lightweight with the new Nitecore LA10 CRI. This innovative camping light is incredibly compact, weighing only 2 oz, after battery installation. Despite it's petite size, this light packs an impressive 85 lumens of brightness and up to 11 yards of illumination with a Nichia NVSL219B LED designed to enhance natural color. When you're trekking through the great outdoors, this camping lantern has your back like the Nitecore LA10 CRI. This pocket sized light offers an astonishing 85 Lumens of LED power in a neatly diffused area, great for campsites or late night navigation. Measuring just over 3 inches in length, the LA10 CRI finds itself at home in any camping or emergency setup, or even right in your pocket! Along with solid aluminum construction and Nitecore brand quality, this little lantern is ready to make a big name for itself among serious campers, hikers and outdoorsmen. With the new rotation interface, the LA10 CRI adds a new twist to the world of LED lanterns. 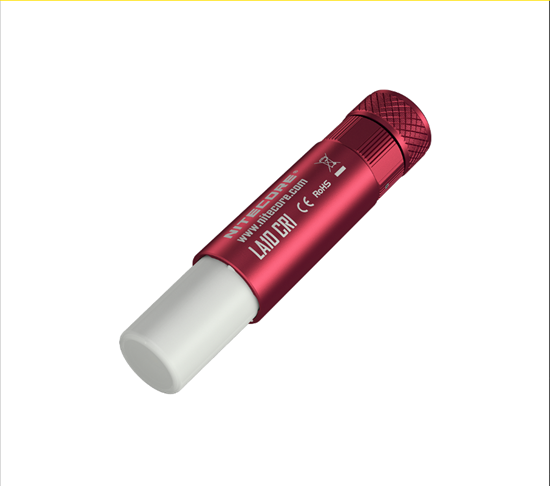 While it may resemble a stick of chap stick, that LA10 CRI provides powerful area lighting instead of protective, lip soothing balm. The interface of this light is just as simple, with a twist interface that allows you to adjust modes as well as extend the 360 degree diffuser with a quick turn. The LA10 CRI comes standard with three distinct lighting levels as well as an emergency locator beacon - an invaluable resource out in the wild!